The first thing you have to do is to decide what operating system you want to use. I would recommend that you visit www.raspberrypi.org/downloads and have a look at what's available. If (like me) you are new to Linux then the one to go for is Raspbian "wheezy". Download the .zip file to your computer - it is quite a large download (about 483 MB) and there are various mirror sites where you can download it from. Once you have downloaded and extracted the .zip file you should have a .img file with a size of 1894400 KB (1.80 GB). This is the bootable image that you will write to your SD(HC) memory card, so obviously you'll need a card with a capacity of 2 GB or more. In order to write the bootable .img file to your SD(HC) memory card you need to download Win32DiskImager (I'm assuming here that, like me, you are a Windows user). Extract the .zip file in the directory (folder) you want to run it from. You can create a shortcut for Win32DiskImager on your Windows desktop by right clicking on the Win32DiskImager.exe file and selecting "Send To Desktop". Take your SD(HC) memory card - if it is brand new it should be ready formatted, but if you have previously used it in (for example) a digital camera you will need to format it in your digital camera first. If your computer has an inbuilt card reader/writer insert the SD(HC) card into the card reader/writer slot. 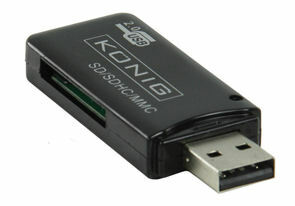 If your computer does not have an inbuilt card reader/writer then you will need a USB memory card reader/writer like the one shown above (available from Cut Price Cables). Insert the SD(HC) card into the USB memory card reader/writer and then connect the USB memory card reader/writer to a USB port on your computer. Double click on the Win32DiskImager shortcut on your Windows desktop and then click on "Run" if you get a Security Warning dialogue. The Win32DiskImager window should now be open. Your SD(HC) card should show up under "Device" at the top right of the Win32DiskImager window - in the above screen shot the SD(HC) memory card is shown as D:\, but you may need to click on the drop down list to select the correct device. Now all you have to do is click on the small folder icon to the left of the "Device" drop down list and navigate to and select the .img file you want to copy to the SD(HC) memory card. Then click on "Write" and "Yes" when asked to confirm overwrite. Writing the bootable image file to the SD(HC) memory card will take a few minutes. 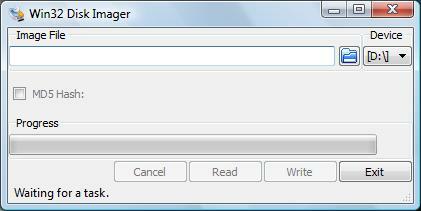 Once complete you should get a "Write successful" message - click "OK" and then click "Exit" to close the Win32DiskImager application. If you are using a USB memory card reader/writer you need to click on "Safely Remove Hardware" and then remove the USB device before removing the SD(HC) memory card. You should now have a bootable SD(HC) memory card for your Raspberry Pi.